FAS then gave the company three months’ time in which to set new prices for buyers of these products, according to a regulation formula. The FAS order to Evraz says the Nizhne Tagil plant “must fix prices for Z sections of steel grades 09G2S [and] 12G2FD in which the profitability of one tonne of Z profiles of steel grades and 09G2S [and]12G2FD shall not exceed by more than 15% of the weighted average return of all products of NTMK, calculated over the last three calendar years based on reports from the [plant’s] Profit and loss account.” The new pricing deadline expired at the start of this month. The law gives FAS the right to fine offenders from 1% to 15% of the sales revenues of the products found to have benefited from illegal pricing schemes. Evraz’s operating and financial reports consolidate sales of all railway products together, including rails and other steel, and it is impossible to gauge the tonnage or value of the Z profiles now subject to penalties. Total railway steel sales for the year for Evraz amounted to 1.4 million tonnes; total revenues for all railway products came to just over $1 billion. A text of the 12-page ruling, dated November 24, 2010, was signed by a 5-man FAS commission of inquiry, in which Ovchinnikov was a member. The products covered by the investigation were Z steel profiles used in the manufacture of rail freight gondolas and platforms for tanks, hoppers, and other rail cargo wagons. Competing imports, steel products from Azovstal in the Ukraine, were reported by FAS to have been rejected by the Russian car builders for failing the Russian product quality standards. This created a situation, according to FAS, in which the Evraz mill at Nizhne Tagil, in the Urals region of Sverdlovsk, was the dominant, quasi-monopoly supplier to the domestic market. Reviewing prices of the Z profiles over an 18-month period from January 2009 to June 2010, FAS found there were significant differences in the pricing of the same product for five different Russian customers. The complainant, Uralvagonzavod, was found to be the leading buyer of this steel, but was disadvantaged in relation to its competitors by Nizhne Tagil’s price discrimination policy. The percentage difference and the price value are classified in the report release. A source close to the investigation has told CRU Steel News the price differential between buyers of the Z profiles ranged from 10% to 60%, while the profit markup differed by between 12% and 200%. Production costs were found to be the same for goods shipped to the different buyers, but the price differential resulted from the fact that the Evraz pricing policy set different profit mark-ups for different buyers. One buyer, Altayvagonzavod, was found to be enjoying purchasing advantage over Uralvagonzavod, even though the former plant was in Altai region, 1,835 kilometres away from Nizhne Tagil, while Uralvagonzavod was just 10 kms away from the plant in Sverdlovsk. 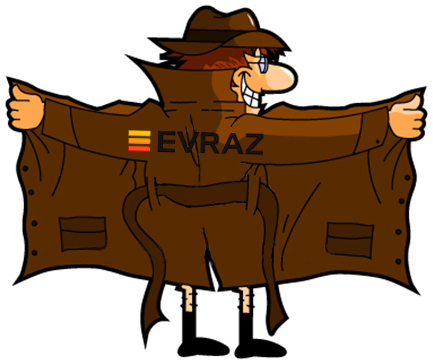 Evraz has not reported the FAS judgement against it on the company website. The only company report about Nizhne Tagil in the period of the FAS ruling claimed that modernization at the converter shop at the Nizhne Tagil mill had been completed by November 24, and that the output capacity of the production line had been raised by 700,000 tonnes to 4.5 million tonnes per annum. The cost of the equipment replacements was reported at $50 million. The agency also ruled that these differentials were “economically and technically unjustified…[and] did not depend on the volume of supplies and the transportation costs”. The FAS says it will fine the violators an amount to be calculated shortly of between 1% and 15% of their sales turnover for coking coal in 2010. An analysis by Uralsib Bank analyst Dmitry Smolin, reports that the fine for Raspadskaya in this case would be $17 million, based on estimated domestic sales revenues of $348 million. Ovchinnikov of the FAS also told CRU Steel News that a ruling on charges of price fixing by Evraz’s Kachkanarsky mining company for vanadium sales will be finalized on April 7. Vanadium is a steel-hardening alloy used by steelmakers for a range of applications for the car and construction industries. Evraz is also a quasi-monopoly miner of vanadium ore and concentrates in the Russian market, while there are just two refiners of the product into ferrovanadium. They were the subject of a US trade investigation for dumping priced sales in 2006.